I remember cool edit, but just for farting with audio at work I use Audacity. But it dosen't come with an MP3 encoder. Neither does SONAR, the bastidz charge $30 extra for it. It will use lame also, but I haven't configed it yet. itunes is not my friend. He would not be in the house if the childrings did not insist. He most certainly isn't allowed on my studio PC. 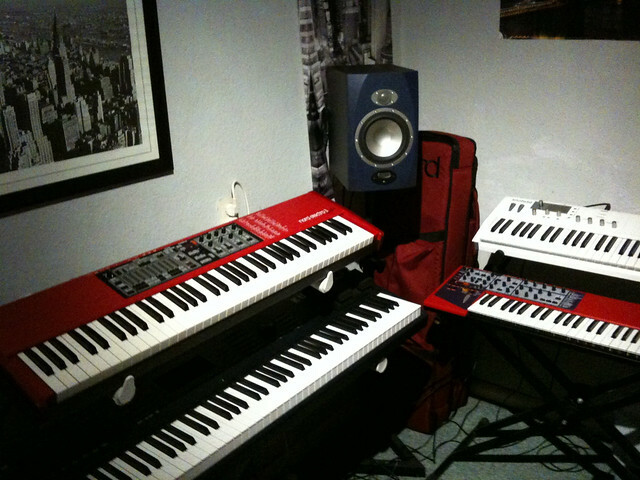 Right now, it's a Nord electro 3 on a stand waiting to be sold, a Nord Lead 2x in case against the wall, waiting to be sold (someone actually offered me €100 ) and a Waldorf Blofeld Keyboard against the wall, WAITING TO BE SOLD. I am ensaddened that you're selling off your gears, Tom. It ain't right. I'm convinced it's the right thing to do at this time. I'm going to make pretty music when all that stuff is gone (hopefully, lol!). is that in the post band sell off? I guess didn't realize the stuff you had. what's the long range plan? you got some keepers there for sure. Long range plan? I guess I'll just wait and see what happens. Short term plan is getting an imac and softies and making some music. It's been a while since I've written a song.. It's been even longer since I've recorded one. Btw, everything is replaceable. The Electro 3's hammond section will be replaced by VB3, the EP's and AP's by the Kurzweil, the Nord Lead and Blofeld by Albino 3 and maybe some other stuff... I've pretty much got everything I need.. Consider getting Largo. I think in no way Albino is a replacement, unless you just like it better. Then more power to you. I found largo to be much more powerful in sound than just about everything VSTi. If you do the major sell off, what are you going to do with all the loot? Part is going to the imac and softies. The other part I'm saving since I want to move out of my parents house next year and get a place of my own. an evenings work and studio whatever.0.something is underway! I modded my 3 tier with another shelf for the laptop. it's roughed in right now but I just put some bolts through the stand and shelf and used nuts to secure everything. I need to make some final adjustments, such as lowering the shelf even with the keyboard and countersinking the bolts. I lost my countersink bit somewheres I'll find it though. So my next plans are to put a shelf across the second tier that's long enough to put some speakers on the sides and then i'll add some rack synths in the middle and maybe the same for the top or a keyboard. and yes i went with the maudio 61es. it's really not that bad. about on par with my old PCR minus the ragged out damper pads. I'm not used to the semi weighted feel though. I'll get used to it. Well here it is.. my 2,000$ oaysys. Now that everything is permanently setup, I find I have suffer the nightmare of learning to set configurations, quantization and all sorts of things inside Live. The LPD8 works like a dream except the knobs are absolute crap, not to mention they are so short there's no way you can grab one without a pair of tweezers. So i'm looking for replacements. I ditched the Roland / Cakewalk UA-1G which had crap drivers for the NI Audio 2 DJ. Well that looks just Dandy! Pretty portable and quick setupish, too. Thanx. That's why I didn't go with the APC40. I really would like to get out live again and I wanted something that fit in a laptop bag. After years of hauling a PC around, controllers, keyboards, mixers etc, I want something small enough that all you have to do is request a table from the venue, or borrow someones keyboard stand. Then when you're done, you pack it up and walk right to the bar for a drink and you don't have to worry about someone breaking into your car or having it stolen out of someones back room.